Provides customized sizes of stainless tubing. Offers company and application information. Greenville, PA.
Community bank offers financial services to Greenville, Pennsylvania. Business coach based in Greenville, SC. Specializing in commercial, advertising and industrial photography. Greenville. Architecture, planning and interior design from Greenville. Provideds banking products and services for Greenville, NC. Book and CD design, illustration, and photography. Greenville, South Carolina. Manufactures nets and fish farming equipment. Greenville, Mississippi. offering cold storage and delivery to businesses in greenville, wisconsin. Provides residential mortgage financing for Spartanburg, Greenville, Columbia and all of South Carolina. Appraises residential and commercial property for Greenville, Greer, Pickens, and Anderson SC. Offers building, land use, and facilities design and planning services. Based in Greenville, NC. Bottler serving Eastern North Carolina. Includes history and vending opportunities. Located in Greenville. Shown are galleries, designer biography and contact information. Located in Greenville. Shown are both a commericial and residential portfolio, services offered and contact form. Provides planning and developmental services in the areas of operations and facility management. Located in Greenville, SC. features airlines, flight schedules, general aviation and cargo, and directions. Provides parts, sales and 24/7 emergency service for air compressors and related equipment from offices in Greenville, Columbia and Charleston. Offers telephone systems, local and long distance, structured cabling and internet services. Greenville, NC. Sheetfed and web heatset printing, with prepress and bindery. Equipment list. Locations in Columbia, Charleston, and Greenville. Northern Greenville County Firm that provides tax, bookeeping, and accounting services for small businesses, individuals, and non-profit organizations. Serving Georgia and the Carolinas. Includes company history, exact service area, and qualifications. Greenville. Open to anyone who lives or works in Eureka, Montcalm, Sidney or other select areas. Greenville, South Carolina company offering signage for the real estate and home building industries. Wedding and event video production company operating out of Greenville, SC, includes details on services, samples, and contacts. Provides professional, portrait and wedding services, includes an image gallery and contact details. Based in Greenville, SC. Greenville, SC based supplier of high-speed Internet, data, local and long distance telephone services. Offers police dog training. Features mission, products, services, dogs for sale, news, articles. Greenville, North Carolina. Area bottler offers Pepsi history and vending opportunities. Specializes in the management of small capitalization growth equities. Planning, designing, coordinating and managing the construction of custom residences, and renovations and additions to existing structures. Greenville, South Carolina. CPA firm headquartered in Greenville with seven additional offices. Includes newsletter and publications, company profile and staff biographies, description of services, and links. Quality registered Alpine Dairy goats for milk and show. ADGA member, DHI records and appraisal scores available. Located in Greenville, WV, USA. Community-oriented bank provides the financial needs of Easley, Pickens, and Greenville, South Carolina. Small dairy farm in Greenville, WV. Kayloma Nubians Smooth Design. We are also known for our Grooming and Boarding Kennels. Offers five day turnarounds for residential valuations in Greenville and Spartanburg counties, includes zip codes served, neighborhood links, and an overview of the valuation process. Servicing the metropolitan Greenville and surrounding area. Includes profile, list of services, on-line order form, contact details and related links. Find out about wedding services including video, portraits, and other works by this photographer serving the greater Greenville, SC area. Community oriented bank providing details on financial services for Easley, Pickens, and Greenville, South Carolina. Organizes closets, workspace, tool areas, and pantries. Includes product portfolio. Located Greenville, South Carolina. Provider of home, auto, life, and health insurance from offices in the Charleston, Hardeeville, Greenville, and Estill areas. Includes profile, FAQs, and career opportunities. Portfolio, including still life, people, food, conceptual, and location work, and a studio tour. Offering conventional and digital imaging capabilities. Located in Greenville, NC. 50 Farmers Livestock Marketing Association Greenville, Illinois. Greenville, Illinois. Sales of swine, cattle, sheep, and goats. Includes market reports, location, and special sales. greenville, pennsylvania, operator of charter bus services, sightseeing tours and school bus contracting. includes information on tours, charters, and employment. Design, planning, and interior design for college buildings, schools, churches, health care facilities and commercial environments.Ãƒâ€šÃ‚Â Greenville. providing electricity, natural gas, water, and sewer to residents and businesses in greenville and spartanburg counties in south carolina. account review, service details, and fees. Independent agency offering details on insurance, risk management and financial services to individuals, families, businesses and industries. Locations throughout the Greenville-Spartanburg area. Offers hot, cold, corrective, and therapeutic shoeing. Contains rates, rules, information on laminitis, list of local trails, FAQ, and photos. Located in Greenville, South Carolina. Personal chef and catering service in the Penquis region, including Greenville, Dover-Foxcroft, and Bangor. Also prepares custom cakes. Includes contact info and pictures of sample birthday cake. Architecturally designed house plans, modifications, and construction. Based in Greenville, South Carolina. Suppliers of nickel, cobalt, and iron based alloys produced as ingots, pigs, shot and powder. Production techniques include electric arc furnace, AOD, induction furnaces, and various crushing, grinding, and sizing equipment. Offers valuations of single-family homes, condominiums, multi-family units and vacant land. Includes online ordering and quotes. Serves Greenville and several surrounding counties. Virtual assistant offering rÃƒÆ’Ã‚Â©sumÃƒÆ’Ã‚Â© services, typing, word processing, proofreading, and other office support. Based in Greenville. Commercial offset printer offers process color printing, color as well as black and white copies, die cutting, folding and numbering services. Greenville. Offers title binders and insurance, statewide closing services, information on property taxes, mortgage financing, and exchanges and trustee services. Based in Greenville, North Carolina, United States. Works in painting, sculpture, glass, and ceramics. Located in Greenville, North Carolina. Estate sales, antiques, and donated vehicles. Located in Greenville, SC. Sells markers from over ten manufacturers, goggles, barrels, air systems, parts, paint, media, and accessories from a warehouse in Greenville, South Carolina, United States. Original designs with silver and other metals, river stones, porcelain shards and glass beads. Made in Greenville, SC. Rehabilitating injured and orphaned animals before releasing them in the wild. Located in Greenville, South Carolina. Established 1972 in Greenville. Sit includes a schedule of area running events, results, and membership information. Facility information, class schedule, calendar, information. Located in Greenville. Greenville hospital describes medical services and provides a physician directory, online gift shop, and information on volunteering. Greenville, North Carolina. Serving all United States Bowling Congress (USBC) sanctioned bowlers, including men, women, and youth teams and events. Greenville, North Carolina F-body club for all generations. Details for the toll bypass around Greenville to the south. Virtual tour, newsletterand a list of services. Picture gallery, memorials, and breed information. Greenville, Michigan. Describes postpartum services in Greenville with contact information and images. 84 Whiteside School Of Karate Greenville based. Greenville based. Forum, photographs and news. 85 RiverRun Rottweilers Greenville, Michigan. Greenville, Michigan. Home of Ch. Crystals Gemstone v Ponca, CD. Contains news, schedule, roster, statistics and archives. Schedule and information from this East Coast Hockey League team. 88 Jo An Jos Producing miniatures. Producing miniatures. Show pictures, litter announcements, and pedigrees. Greenville, Pennsylvania. Located in Greenville. Photographs, breed and cattery information. Dedicated to perpetuating the Spanish Barb Horse. Located in Greenville, Texas. Two 18 hole miniature golf courses in a family entertainment center in Greenville, TX. Includes calendar, photos, contacts and high adventure events. 96 Urologic Consultants, P.C. Brian A.
Brian A. Roelof, M.D., Jon M. Curry, M.D., John G. Anema, M.D. in Grand Rapids and Greenville. The World Powered Parachute Championship, held annually in Greenville, Illinois, USA. Breeders and importers of showing and working bloodlines German Shepherd Dogs. Greenville, Ohio. Breeder in Greenville, South Carolina and Munich, Germany. Information about the cattery and the legend. Photos. Ladies-only, PACE 30-min circuit, personal trainers, extracurricular and philanthropic activities. Greenville. Includes sales list, photos, and profiles of horses. Offers web design services. Located in Greenville. Located in Greenville, Illinois. Includes track map, photos, past results, and related links. Offers general unit information on activities, joining and advancement, photos, a calendar, resource links and contacts. Describes professional services such as diagnosis and treatment of diseases and injuries of the eye, locations in Greenville, Spartanburg, Clemson, and Anderson. Guided tours, rentals and lodging. Includes package details, rates, directions and contact information. Located in Greenville. Small animal and equine clinic in Greenville. List of services, office hours and location, links, and pet care tips. Describes health and medical services, the Fair Oaks Nursing Home, and the Emerald Pointe Senior Living Community. Providing upper extremity care from therapy to surgery. Located in Greenville. Personal training, cardio, circuit training. Greenville. Member of the Northwest Conference and District 10 AAA. Offers trivia, history, schedule, results and game reviews for this Greenville High School team. Offers boarding, lessons, and training. Includes description of facility, instructor profiles, list of horses for sale, and photos. Located in Greenville. Offers fully guided hunts for bear over bait, deer and moose north of Greenville. Services include meals and lodging. State-licensed abortion clinic. Includes staff and directions plus details on the procedure. James Rodowca practices acupuncture in Greenville. Find information about this practitioner, treatment protocols, and prices. Our site support the IPMS/USA organization by promoting the fun and recreation of building scale models. World class award-winning taxidermist and replica specialist. Greenville, Texas. State-licensed abortion clinic, learn about the procedure, meet the staff, or get directions. Referral-only specialty hospital offering medical, surgical, and oncological care for small animals. Description of their services and success stories. Greenville. Large and small animal clinic. List of services, office hours, driving directions, and links. Facial cosmetic, breast enhancement, and body contouring procedures. Dr. S. Graham. Greenville. Find out about services including eye examinations, vision therapy, TLC laser vision correction, and treatment of eye diseases. Teaching Karate, Ju Jitsu, grappling, Tai Chi, sparring (kumite) and cardio-vascular conditioning. Located in Greenville. Standing sorrel and cremello stallions at stud. Also stands arabian stallion. Includes sales list, photos, and profiles of horses. Located in Greenville, Texas. Offers trail rides, birthday parties, lessons, and summer camps. Includes description of services, rates, horse profiles, and photos. Located in Greenville. Breeding and training welsh hunter prospects and standing Elite Earl Grey, 2001 WPSCA and AHSA Year End Award Winning stallion. Greenville, New York. Summer training programs conducted at Furman University in Greenville, South Carolina. Includes general information, schedules, online registration, and directions. Center for education and therapy. Includes therapies, client testimonials, retreats, lodging, FAQs. Located in Greenville, TN. Family run summer camp located in the Sierra Nevada Mountains in Greenville, California. Contains programs, FAQs, schedule, photos, and registration form. Team roster, game summaries, game photos and link to game videos. Based in Greenville. American Bull Dogs and Hog Dogs. Includes pedigrees, photographs, puppies and adult dogs for sale. Located in Greenville, Texas. No-kill rescue group based in Greenville, North Carolina. Traps, tests, neuter/spay and releases ferals, and places rehabilitated cats. Photos and cat care information. Located in Greenville on a 252 acre farm along a scenic byway. Descriptions of beer, merchandise, tour information, history, driving directions, and list of retailers and bars serving their products. Information about a robotic mitral valve repair heart program in Greenville, North Carolina. 148 American Kobudo Ryu Martial Arts Greenville A.K.R. About the practice and procedures including body contouring, dermatology, and laser surgery procedures. Located in Greenville. North Carolina institution embodies networked resources from the local community, Pitt County Memorial Hospital and the Brody School of Medicine at East Carolina University in Greenville. A dirt oval for stock cars and a 1/8 mile dragstrip located near Natural Bridge in Greenville. Track details, schedules, classifieds and links. Located in Greenville, near Moosehead Lake. Offers treed and open 20, 30, and 50 amp sites. Pull-thru sites available to accommodate any length RV. Photos, site map, area activities, and contact information. Located in the Greenville/Spartanburg, South Carolina area. Includes team history, schedule, eligibility, assignments, messages from the coaches, results, meet directions, FAQs, and related links. Aikido and Karate dojo located in Greenville. Offers traditional instruction in Suenaka-ha Tetsugaku-ho Aikido and Matsumura Seito Hakutsuru Shorin-ryu Katatedo. Offers fishing, canoeing and canoe camping, moose photography, grouse hunting and camping, and duck hunting trips. Registered Maine Guide based in Greenville, on Moosehead Lake, and serving in the Maine wilderness from Mt. Katahdin to the Allagash. 158 DataStar, Inc. Greenville, S.C.
Greenville, S.C. retailer of custom PCs, Servers and networking. Web design and services for Greenville and Eastern North Carolina. Offers web development and design to small businesses. Includes contact information. Located in Greenville, South Carolina. Copywriting, design, and page building. Based in Greenville, Texas. CD/DVD authoring, web design, 3D animation, video production, and print design. Based in Greenville, South Carolina, United States. Wireless Internet service provider (WISP) Supplying High-Speed Broadband Internet for North East Texas: Commerce, Greenville, Sulphur Springs, and Paris areas. A Werewolf LARP in Greenville, SC. It includes several pages, including (but not limited to) NPC, Villain, and PC pages, an interactive page that has games, a chat room, and a biweekly poll. Meeting information, tournament schedule, and club information. 174 Whiteside School Of Karate Greenville based. 195 American Kobudo Ryu Martial Arts Greenville A.K.R. 199 Greenville Youth Group Greenville, IL. Greenville, IL. Mission, programs, staff, calendar and directory of Greenville FMC Youth Group. Greenville. Overview, service times, weekly schedule, history and photos. Greenville, South Carolina (nondenominational). Map, meeting times, mp3 sermons and sermon outlines, and theological articles on a variety of topics. Services Greenville area through lost and found, animal control, pet therapy, pet cemetery, rescue programs, spay/neuter clinic, US Customs training center, and animal cruelty. Features available animals for adoption. Contemporary Christian music festival hosted by the students of Greenville College in Greenville, IL. 50,000 watt AM station located in Greenville. 206 Elkton Road Church Of Christ Greenville, Kentucky. personal injury attorneys based in greenville. Beliefs, activities, and early history. personal injury firm with offices in asheville and greenville. greenville firm emphasizing environmental, health, and safety law. services for personal injury and malpractice from offices in greenville. law firm with offices in new bern, raleigh, wilmington and greenville. greenville firm engaging in litigation and business law. services for workers compensation claims from offices in greenville. greenville firm serving small and mid-sized businesses. located in greenville. includes information about their staff and services. greenville law firm, dedicated exclusively to the practice of intellectual property law. 221 Woodruff Road Christian Church Greenville, SC. Includes readings, contacts, photos, and related links. greenville firm providing legal services to businesses and individuals. dedicated to a greenville city police officer who was killed in the line of duty. greenville attorneys handling divorce, child custody and support, and family court cases. serving the greenville and vanceboro areas. provides information about their staff, services and recent obituaries. greenville firm focusing on residential and commercial real estate closings and title services. serving a broad range of business and corporate needs, from offices in greenville and spartanburg. greenville attorney, handing personal injury, medical malpractice, and workers compensation cases. Published in Greenville, this monthly magazine features news of interest to South Carolina Baptists. includes grief resources, as well as details on burial and cremation services. three locations in greenville. Worship schedule, ministries, a calendar of events, newsletter and location. Contains real audio greetings, daily bible verses, ministry information and service schedules. greenville firm focuses on criminal defense and family law. site contains frequently asked questions and representative cases. History, pastors bio, staff directory, calendar of events, sermons (download, MS Word format), and contact form. 240 Greenville Lions Club District 14-F.
District 14-F. Includes fund raisers, history and meeting information, officers, photos, and membership application. Meets on the 2nd and 4th Thursdays, 7:30 PM. (Except 4th Thursday in November and December.) History, FAQ, officers, events and contacts. specializing in elder law, alzheimerÃƒÂ¢Ã¢â€šÂ¬Ã¢â€žÂ¢s issues, medicaid and long term care planning with offices in greenville and clemson. Weekly newsletter of events and activities as well as information on the churchs mission and ministries. Site offers information on staff and ministries, addresses, worship schedule, and contact details. Non-denominational, Christian congregation, includes map, meeting times, mp3 sermons and sermon outlines, and theological articles on a variety of topics. serving a broad range of business needs, with an emphasis on civil litigation and corporate transactions law, from offices in greenville and columbia. details on services from this firm emphasizing trial work in state and federal courts throughout south carolina, from offices in greenville. greenville firm emphasizing real estate and estate planning. 253 Greenville Bible Methodist Church Greenbriar, MI. Greenbriar, MI. One page with a picture of church and directions are included. Contains information on current activities and photos from past activities. greenville law firm, offering services for personal injury and workers compensation. Greenville. Served by the Passionists. Mass times, staff photo directory, mission statement, parish history, calendar. Chartered on October 26, 1991 in Greenville. greenville law firm representing clients in the areas of bankruptcy law, family law, litigation and appeals, medical malpractice, personal injury/plaintiffs, and products liability law. Founded February 15, 2003, in Greenville, North Carolina. 263 Sunshine Assembly No. 375, Order of the Rainbow for Girls Greenville, Texas. Greenville, Texas. Local organization of this masonic-related youth group for girls. overview, staff, services, planning, obituaries, directions, and other funeral service information for the community of greenville. Reaches out to teens, youth, students in the Pitt County area of North Carolina. Includes Worship schedule, pastoral message, calendar, service and fellowship opportunities, faith statements, location, and contacts. greenville lawyer practicing in the areas of personal injury, workers compensation, bankruptcy, family law, estate planning, and real estate. Vowed Franciscan women leading a cloistered contemplative prayerful life. Composite photograph that was found on August 14, 2000 in Greenville, NC. Greenville private, non-profit organization offering services to improve the quality of life for older Americans in Pitt County. representing individuals with veterans, workers compensation, and social security cases, from offices in greenville. faq, with extra detail about veterans cases. forms. Article originally published in The Papyrus, the Greenville College student newspaper, in February, 1996. Includes a collection of links to other Jars of Clay reviews and articles. Serves the area through lost and found, animal control, pet therapy, pet cemetery, rescue programs, spay/neuter clinic, US Customs training center, and animal cruelty investigations. Features available animals for adoption, process, fees, and contact information. Greenville Detachment - Marine Corps League The primary objective of our Detachment is to support our fellow Marines and their families. Melinda (Missy) Fowler, formerly of Greenville, SC. (Greenville) Offers information about the band, its members, performance schedules, news and photos. greenville, south carolina band. biography, pictures, mp3s and lyrics. A Community Theatre Company based in Greenville, Mississippi. Greenville based NBC affiliate, features news, weather, community calendar, and sky cams. [Greenville, South Carolina, USA] Forum, membership information, news, art work, and links. Storyteller and public speaker for all ages. Performance and workshop descriptions, biography, and teachers guide. Greenville, South Carolina. Greenville, South Carolina quartet playing lively jazz, modern pop, and dance tunes. Includes promotional information, biography, and audio. Southern Rock, blue and funk band based in Greenville, South Carolina. Member profiles, pictures, show details and MP3 downloads. cammy award nominated group from greenville, north carolina. profiles, tour dates, mp3s, videos, and merchandise. the what, when, where, why and how of poetry slam in greenville, south carolina, and the surrounding region. the what, when, where, why and how of poetry slam in greenville and the surrounding region. Features top stories, local weather, community news and local links. artists statement, gallery and resume for greenville, south carolina, ceramic artist, dennis stevens, jr.
Rock quartet from Greenville, Texas. East Greenville, PA - Performing arts lessons in Ballet, Tap, Jazz, Lyrical, Hip-Hop, and Acrobatics for the fall through spring session and summer session. Stages six shows each year including drama, comedy, and musicals. Information about the current season, history, biographies, and auditions, opportunities for volunteering, and theatre classes. large auditioned vocal ensemble focused on performing important choral-orchestral literature. current season, chamber ensemble, news, and sponsorship information. Serving the Greenville, Clemson, Anderson, and Greenwood areas of South Carolina. Offers a calendar of upcoming events, club leaders, photo gallery, news letter, tour dates, online membership application. SiteBook Greenville City Portrait of Greenville in Ohio. 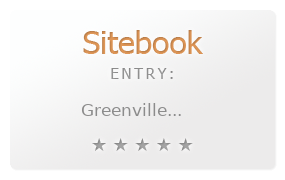 This Topic site Greenville got a rating of 4 SiteBook.org Points according to the views of this profile site.